After another hot lengthy stint at border control and getting another full-page stamp in our passports we entered Cambodia. You can’t really get much crazier traffic than in Vietnam, yet somehow the moment we started driving in Cambodia the driver gunned the massive bus up to nearly 80mph on a narrow two way road through the countryside. 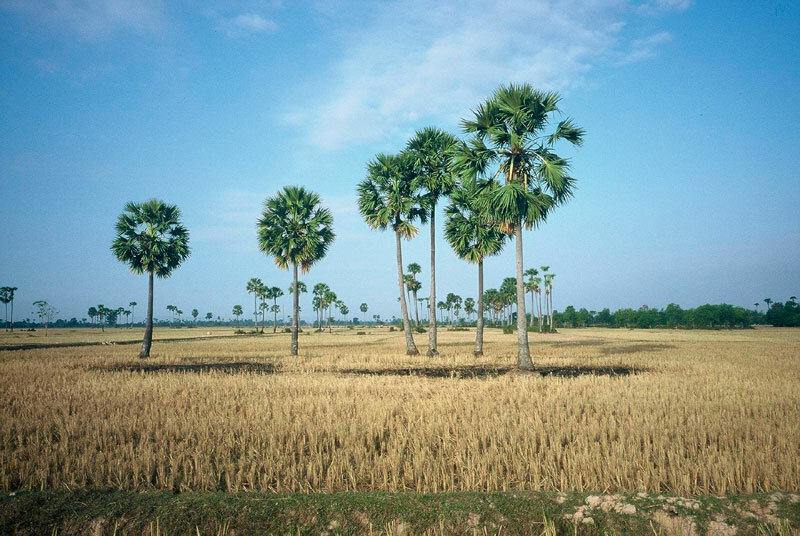 The scenery in Cambodia looks nothing like the mountainous, green, jungles of Vietnam, Laos or Thailand. Instead the landscape was curiously flat, everything had a tint of yellow and there were perfectly straight palm trees sporadically dotting the horizon. Eventually our bus arrived in the capital of Phnom Penh. I was surprised when the ATM dispensed US dollars and there’s a joke with some truth to it that everything costs $1 in Cambodia. We asked a tuk-tuk to take us to a cheap guesthouse, but unfortunately it broke down so it took some time before we arrived. We grabbed some dinner at a Cambodian restaurant across the street where I indulged in some seriously spicy, but delicious jungle curry. Halfway through the meal a strange sensation began to occur within my body. My entire forehead started to burn very intensely, a feeling I’ve never experienced before. I tried to ignore it, but eventually it started going completely numb and I was growing increasingly confused and concerned as to what the hell was happening to my forehead. As thoughts of some crazy Cambodian exotic jungle fever began to enter my mind I realized that my fingertips were also experiencing the same sensation. It was at this point that I discovered what had happened. My curry had been presented with a small plate full of vicious looking spicy peppers. Being the manly adventurer that I am, I decided it would be a good idea to break apart these peppers with my fingers and add it to my curry. 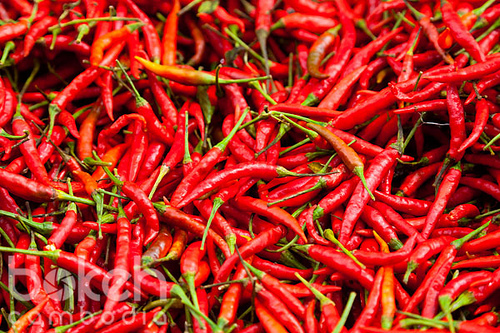 Be Careful of Cambodian Peppers!! The intense heat of the food caused me to frequently wipe my brow of sweat, so clearly the pepper was so powerful that it not only numbed my fingertips, but also had spread to my forehead!! An awkward feeling to say the least my forehead was numb and burning for over an hour. After dinner we decided to walk around a bit and stumbled upon a Cambodian beer garden. As we sat down with beers in a strange setting we noticed the unbelievable hotness of the Cambodian women sitting in the garden. Jaws to the floor in amazement of the beautiful creatures all around us we began consuming pitchers of beer. Unfortunately my travel buddy was dealing with quite possibly the worst bout of constipation in Cambodian history and after only a few beers he literally thought his life was nearing an end because he was so full. I found it hilarious at first until I saw the pained expression on his face. 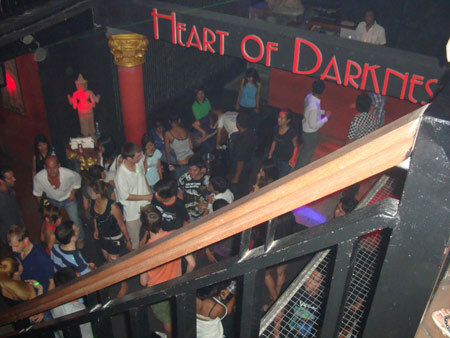 We heard about a nightclub called “Heart of Darkness” and with a name that cool we had no choice but to visit. I promised by buddy we would stick to shots of liquor so he wouldn’t physically explode and we hopped on a motorbike taxi to the club. The “Heart of Darkness” was like no other club I’ve ever seen, themed like a stone jungle temple, blasting Asian-style house music with lasers everywhere. Gorgeous Cambodian women were staring us down as we entered, but the drinks were quite pricy for an otherwise unbelievably cheap country. We opted to go drink some at the bar next door to save some money before breaking out some dance moves in the club. The bar was called “White Cobra” and we took some shots of Mekong whiskey while watching sumo wrestling on TV. Feeling good we made our way back to the club and were big hits on the dance floor. At first we were amazed at how well our dance moves were attracting women, but after awhile we realized that nearly all of the women were clearly prostitutes. Disappointed that our dance skills weren’t actually a magnet for chicks we eventually hailed a tuk-tuk home and crashed for some much needed sleep. This entry was posted in Cambodia and tagged Adventure, Cambodia, Heart of Darkness, Phnom Penh, Travel by verenico. Bookmark the permalink. Great blog and very informative.